OTTAWA - The body of Master Cpl. Byron Greff was given a subdued farewell Monday with only a handful of Canadians present at Bagram Airfield outside of Kabul for his final flight home. The simple send-off was in stark contrast to the powerful ramp ceremonies that were held in Kandahar for each of the combat mission casualties — events that were held under the glare of media coverage and in the presence of thousands of NATO soldiers. 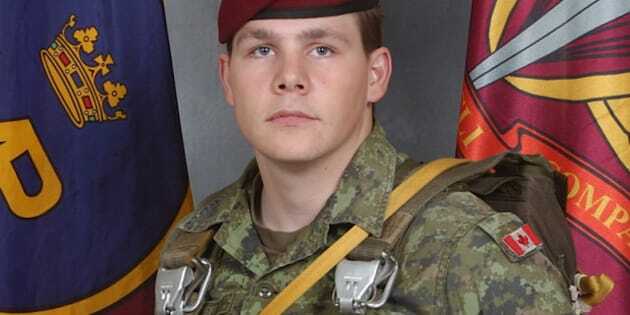 Greff's remains are being flown to Germany aboard a Canadian C-17. A repatriation ceremony was expected to take place at the air base in Trenton, Ont. as early as Tuesday. A suicide attack which claimed the life of Greff and 16 others Americans, Afghans and Britons is believed to be the work of the notorious Haqqani Network, an ultra-violent Islamist group with close ties to al-Qaida. A vehicle packed with explosives rammed into a heavily armoured NATO bus — known as a Rhino — on Saturday in the Afghan capital, reducing the vehicle to a flaming skeleton. Intelligence officials in the U.S., who spoke on background Monday, said the group has been using bigger vehicle bombs in an increasing number of attacks in and around the Afghan capital where the bulk of the 920 strong Canadian training contingent based. A similar suicide truck bombing outside a U.S. outpost a few weeks ago injured 71 American soldiers. The latest developments came as the government struggled in the House of Commons to define the word "safe" as it related to the training mission which is scheduled to last until March 2014. "There is no way — no way — to eliminate all risk, given the reality of that country, given the security climate that is there," said Defence Minister Peter MacKay, who emphasized measures being taken to protect the troops. "We can never mitigate that risk to zero." Both the government and the military have been quick to emphasize that Greff's death did not occur in combat. Given that the bulk of Canadian casualties in Kandahar were the result of roadside bombs and booby traps, political observers say it's an artificial distinction from a government eager to convince people that the country's war is over. "They know the war was unpopular," said McGill University military historian Desmond Morton. "The war isn't over until our training mission comes home. As long as we're still there, we haven't won the war, nor have we entirely lost it." Troops may not be chasing Taliban outside of the wire and there are fewer of them involved in the training mission, but Morton said those distinctions mean little to Greff's family and child, who was born just a few weeks ago while he was on leave back in Canada. "He's dead and died in Afghanistan. And I can't see why there would be any difference," he said. Following the bombing, Greff was counted among American casualties by a majority U.S. media outlets. The small, but important, oversight reflects the shifting sands of popular perception of Canada's legacy in Afghanistan a decade after Canadian soldiers first arrived there, defence experts say. The Washington Post, the New York Times and other august publications reported that 13 Americans had been killed in the powerful explosion and the mistake was allowed to stand despite efforts of the Canadian military to convince the Pentagon to acknowledge the Canadian casualty, defence sources said Monday. Retired colonel Pat Stogran, the first Canadian battle group commander in Kandahar in 2002, said on a military level, the Americans are respectful of the losses of other countries, but there is a narrow self-serving interest in Washington to write allies out of the Afghan script — something that is being reflected the U.S. media. "It's all about politics," said Stogran, who served as Canada's veterans's ombudsman. "It's like politics anywhere. There's so much money, so many lives, they want the credit to go to them." But the U.S. ambassador in Canada, David Jacobson said each loss is felt and recognized in Washington. "This is a tragic event for all of us," he said in a statement Monday. "There is no question where the United States Government and the American people stand on the matter of Canadian contributions in Afghanistan. Canadians have paid the ultimate price and we are thankful for their commitment. They've stood shoulder to shoulder with us the entire way." Jacobson also expressed his "deepest sympathies" to the Canadian military and Greff's family and friends.